April 9, 2019, 11:24 AM · In an effort to promote the coverage of live violin performance, Violinist.com each week presents links to reviews of notable concerts and recitals around the world. 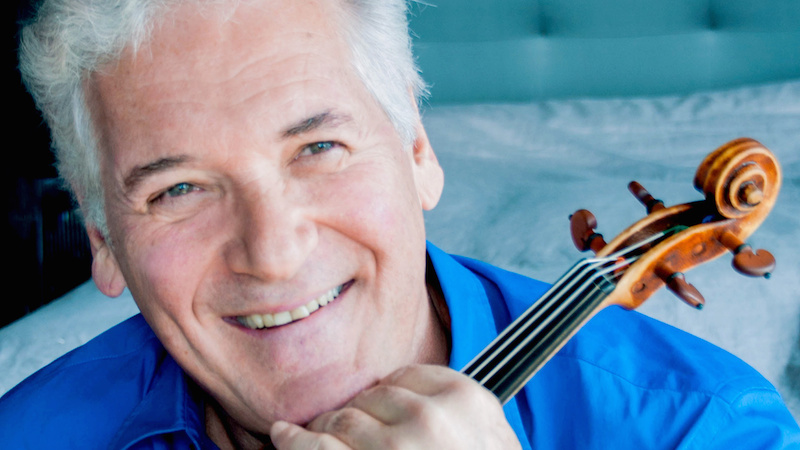 Pinchas Zukerman. Photo by Cheryl Mazak. Pinchas Zukerman performed the Beethoven Violin Concerto with the Royal Philharmonic Orchestra. EdinburghGuide.com: "He played the concerto as if it was as familiar to him as breathing and in the middle movement he played with such sensitivity one almost had to strain one’s ears to listen. It was truly a memorable performance and he, along with the orchestra, received a well-deserved rapturous response." Patricia Kopatchinskaja performed the Tchaikovsky Violin Concerto with the Los Angeles Philharmonic. Los Angeles Times: "(Conductor Mirga) Grazinyte-Tyla’s sensitively elegant stability gave the violinist the antic expressive room she needed to hop around the stage figuratively and literally while still keeping the performance smartly yet excitingly together. I suppose the main reason Koptchinskaja can drive some musicians to distraction is her capacity to play every phrase differently than any other soloist ever has." Simone Lamsma performed the Beethoven Violin Concerto with the Sydney Symphony Orchestra. The Sydney Morning Herald: "Simone Lamsma played Beethoven's Violin Concerto in D, Opus 61 with rewarding musical thoughtfulness and impeccable instrumental accomplishment, making her violin radiate with a sound of rich sweetness and golden colour." The Daily Telegraph: "...the soloist must contend with an orchestral score on a symphonic scale, filled with much-loved melodies and a fair sprinkling of virtuosic double stopping, soaring octave arpeggios, lightning fast scales up and down the fingerboard and stratospheric whispering moments where intonation has to be spot-on. None of these potential snags — nor the formidable Fritz Kreisler cadenzas — fazed 34-year-old Dutch violinist Simone Lamsma making her much-anticipated Sydney debut. This was a subtly weighted and shaped performance with sensitivity given to Beethoven’s singing lines." J-Wire: "She chose the Kreisler cadenza for the first movement and that was impressive, as was the tenderness she injected into the slow movement. But her brief cadenza in the third movement let the lion out of the cage and from there she seemed to take charge and bring the concerto to a resounding, applause-worthy conclusion." Augustin Hadelich performed the Sibelius Violin Concerto with the Dallas Symphony. Theater Jones: "Hadelich gave a magnificent performance and the listeners were astounded by his impeccable technique; the rapturous audience demanded an encore. He reaffirmed our evaluation by launching into Paganini’s Caprice for Solo Violin, Op. 1, No. 24....it is packed with mind-boggling technical marvels, which Hadelich tossed off with élan as though it was a student’s piece." The Dallas Morning News: "Hadelich commands a formidable technique — displayed even more dazzlingly in 'the' Paganini Caprice No. 24 — but he's never a showoff. He always seems so totally to identify with the music that ego never intervenes. That is high praise." Jennifer Koh performed Prokofiev’s Violin Concerto in No. 1 D major with the Jacksonville Symphony. The Florida Times-Union: "This work shows Prokofiev at his most lyrical and imaginative, and Koh was an ideal interpreter, keeping the melodies clear and projected in the most tender and intimate moments. Happily, Koh also had all the required firepower and deployed fusillades of notes deftly in the thundering passages. She displayed not just understanding but a commitment to the piece that made for an exceptional musical event." Sandy Cameron performed Danny Elfman's violin concerto, "Eleven Eleven," with the Royal Scottish National Orchestra in Los Angeles. Violinist.com: "Cameron proved to be a musician with the chops of a virtuoso violinist, the moves of a dancer and the charisma of a seasoned live performer." People's World: "Cameron played the score by heart, fully giving herself to sinuous feline movement and dance with her lithe, athletic body in a supple rock-star performance that went far into and beyond the musical, her mop of dark brown curls bouncing ecstatically around her head." The Scotsman: "Despite the obvious derivative influences on this concerto, from John Adams to Shostakovich and Prokofiev, it was Cameron’s alluring performance style, a supercharged energy coursing through every part of her body, from whiplash bow strokes to mesmerising balletic footwork, that held it together and drew instant whoops and cheers." Vadim Gluzman performed the Bach Double with violinist Alina Kobialka and ProMusica Chamber Orchestra. The Columbus Dispatch: "Gluzman and Alina Kobialka, a student at the Cleveland Institute of Music, were well matched as co-soloists in Bach’s Concert in D minor for Two Violins, BWV 1043." Nicola Benedetti performed Mozart Violin Concertos No. 3 and No. 5 with the Scottish Chamber Orchestra. The Scotsman: "This was a stylish reading with the players relishing the pseudo-eastern effects, including the clack of wood on strings from the cello and bass bows, while Benedetti’s precise and elegant phrasing was spot on." Chee-Yun Kim performed the Tchaikovsky Violin Concerto with the Albany Symphony Orchestra. timesunion: "Chee-Yun, the soloist in Tchaikovsky’s Violin Concerto, had an impressive command of the demanding showpiece." Guillermo Figueroa performed Ernesto Cordero's Concerto for Violin and Strings with the the Sarasota Orchestra. YourObserver.com: "Figueroa is a strong violinist, with a big sound and solid technique. After an electrifying cadenza passage, the thick string chords of the second movement provided a lush background for a beautiful latin melody, leading to a rather jazzy third movement and a perpetual motion finale. It was really chamber music of the highest order."